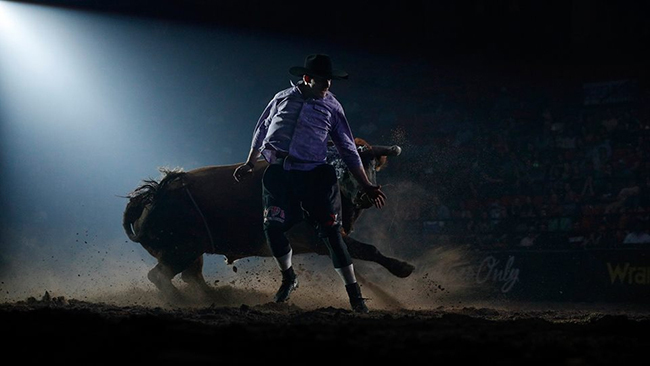 WICHITA, Kan. – Bullfighters Only will invade central Kansas on Saturday, as the world’s top freestyle bullfighters compete in the BFO Wichita Invitational at Park City’s Hartman Arena. As has been the case the last two years, the race for the world championship is getting tight. Heading into the Wichita Invitational, Weston Rutkowski owns a $5,000 lead over Toby Inman, while Kris Furr is just $3,000 behind him. Inman, who owned the top spot for a majority of the season, now finds himself trailing with a big purse on the line at Hartman Arena. “The 15 athletes set to compete in Wichita are the ones who have been performing the most consistently all season long” said Luke Kaufman, Bullfighters Only’s production manager. Rutkowski understands the race because he has been atop the standings each of the past two seasons. While he’s fallen a bit behind his normal pace in 2018, the reigning BFO champion overtook the lead two weeks ago in North Carolina. Kris Furr’s outlook is much the same. He has been among the top 3 in the standings all season, but there is no denying that he could use a boost going into December’s BFO Las Vegas Championship. “I try not to think about it too much, but if I can go in there and win, it will definitely set me up really good,” Furr said. “Last year when we got to Vegas, everything had to fall my way for me to catch Weston. Winning Wichita would definitely help me be in position. This is a true gladiator competition – man vs. beast in a showcase of amazing athleticism, animal aggression and acrobatic feats by the greatest bullfighters in the business. Scores are based on a 100-point scale, with half the score coming from how aggressive the animal is and the other half from the bullfighter’s ability to remain in control while maneuvering around, and, jumping over the bull. The event will also play host to the inaugural BFO Total Feeds Cattle Battle. It will feature five stock contractors, with each entering a team of four fighting bulls to be judged. The top bull team will take home $10,000. Furr has been around bull riding organizations that have had bull team competitions, so he knows what bullfighters can expect. After being sidelined for a year and a half, BFO pioneer Ross Hill returned to action in July with a vengeance. He won three events in a row – Salinas, Calif., and Washington events in Kennewick and Ellensburg, before a tough match-up in Lewiston, Idaho, against Costa’s Spitfire threw off the streak. “I don’t feel like I’ve been in a slump at all,” he said. “I haven’t fought more than nine bulls this year. I finished second once, then I got run over in Charlotte (N.C.). Rubbing is racing, as they say in NASCAR, and that’s part of bullfighting. I’ve just got started on my roll. It’s more than a gamble, though. Bullfighters Only has reignited the fire that is freestyle bullfighting. Part of the attraction comes from the excitement and overall entertainment value that comes from the BFO’s live event production. Kaufman grew up around event production and was involved in the formation of the now-defunct freestyle bullfighting league, Ultimate Bullfighting. The platform has been noted by BFO founder Aaron Ferguson as one of the original inspirations for Bullfighters Only.